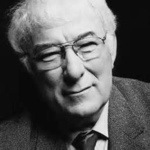 Seamus Heaney, Irish poet and Nobel prize winner for Literature, passed away on Friday. The outpouring of grief over the past two days has been extraordinary and comforting: his beautiful words of remarkable lyricism have been poured all over the media; his smiley eyes peering out from every newspaper. I remember realizing how profound a poem can be; and in the hands of a master, truly perfect: each word weighted and balanced, sparse lines painting an image so succinct and colourful. 6 Responses to "Seamus Heaney"
You have summed him up beautifully. An incredible legacy indeed. I hope to be able to pass some of this on to my kids when they are ready. Many people seem to remember this one from primary school. I must have had a different book. I’m ashamed to say – and me with an English degree from UCD – that I never studied any of his poetry at any level of my schooling. I read this for the first time yesterday – and it hit hard. What a lovely post for a lovely man. I met him once, when I was a teenager, probably studying his amazing words in school and I remember blushing because i was just so in awe of him. He smiled at me and shook my hand and I never forgot it. He will be missed.